I am here…listening to you! to the needs of near and dear ones that you seldom listen to this voice. every day; however, we are too busy following a rut, aren’t we? silencing your mind. All you need is a quiet place and 2 minutes of your day. you can increase the time (15-45mins). that your cup is empty and you can fill in new positive thoughts. yourself, spend some ‘Me’ time and so things that you love. classes and I must say, the 2 hours I spend there, is truly amazing. you, trust that gut feeling and take risks. It’s high time you change! Part of the Ultimate Blog Challenge. 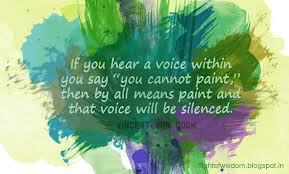 There are two voices in each person. One tells us to go ahead and the other pulls you back. Respect the one that pulls us back for there may be pitfalls. It's not voice to go ahead each time. Weigh the pros and cons and then decide.But fill the mind with good thoughts. Gayatri u have raised a good point about cultivating a hobby. thumbs up. Yes many a times, our gut feling warns us, gives us signs, not to follow some path. I agree with you, that we need listen to both the voices and weigh the pros and cons! Wow gayu, this was an inspiring post truly!! I unwind myself with music and books…. not to forget my blog. 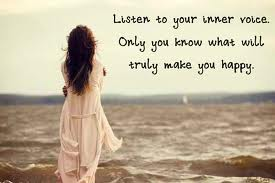 It makes me listen to my inner voice LOUD and CLEAR. There are some very special people in my life whose letters, emails and comments are something that keeps reminding me what my true calling in life is and that I should never forget that. Hmmm…you are very special indeed!!! Lovely post, Gayu. I like to think of those 2 voices as Sauron and Sam, from the LOTR series. Sauron is always sending discouraging and demotivating thoughts to our body (Frodo), persuading us to give up, while Sam gently whispers in our ears – "one more try". I wrote a post on this during the very first NaBloPoMo I attempted on my blog. Here's the link, if you want to check it out – Live Life: Motivate Yourself". I use all 5 points mentioned by you in the post, but meditation works best for me to strengthen Sam's voice within me. Where are your subsequent posts by the way? Day 10 onwards? Visiting after a long gap. Read 2 current posts as have no stamina to catch with all pending ones. Could relate to what Samu says so much. May God bless her. Very sane advice in this one. One surely needs to look on the positive side and be happy instead of looking at negative side leading to loss of happiness.